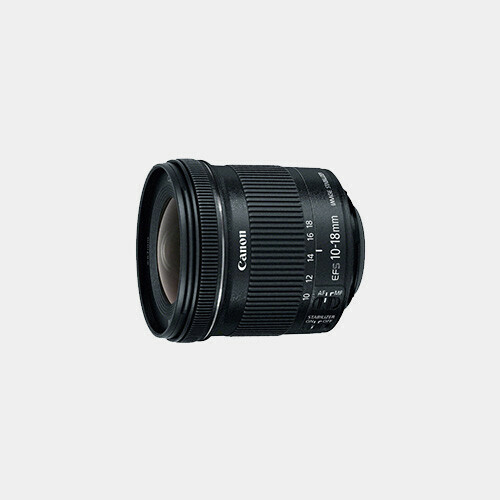 The Canon EF-S 10-18mm f/4.5-5.6 IS STM Lens is a wide-angle zoom lens designed specifically for EOS APS-C DSLRs, where it provides a 35mm-equivalent focal length range of 16-28.8mm. The optical design incorporates one aspherical element, one UD (Ultra-low dispersion) element, and one large-diameter element to minimize chromatic aberrations throughout the zoom range and contribute to notable image sharpness and clarity. An Optical Image Stabilizer has been integrated into the lens design to minimize the appearance of camera shake by up to an effective four shutter speed steps. Pairing well with Canon's EOS Movie Servo AF, an STM stepping AF motor produces smooth, near-silent focusing performance that is further benefitted by a rear-focus design, high-speed CPU, and intelligent AF algorithms for quickened focusing. Full-time manual focus override can also be utilized for fine-tuned focusing precision as closely as 8.7". 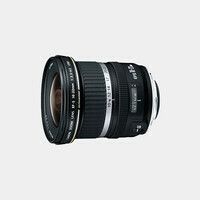 This lens is only compatible with Canon EF-S cameras: T5i, 70D, 7D, etc.